Milky Way: Astrophoto of the galaxy by Michael Shainblum. 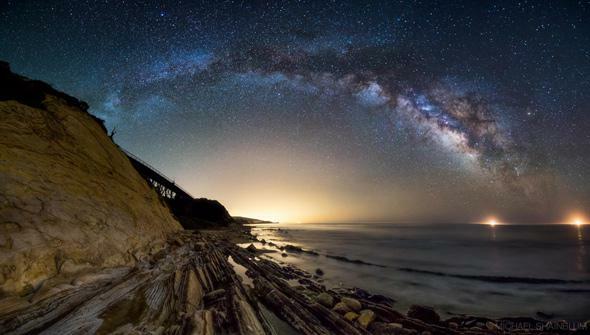 The Milky Way sprawls across the Pacific. Click to galactinate. He was in Gaviota, Calif., when he took this shot in April 2013. He used a fish-eye lens, which is why the normally straight glow of the Milky Way appears curved. The 30 second exposure blurred and softened the incoming waves from the Pacific Ocean, somewhat appropriately giving a milky feel to them. My eye was drawn to the rocks there; the long sheets of sedimentary layers tilted at an angle, presumably laid down flat millions of years ago and then later canted by the rock uplifted to the left (north). You are here: illustrated map of the Milky Way. Click for more info. I’m commonly asked what it means to see the Milky Way in the sky. 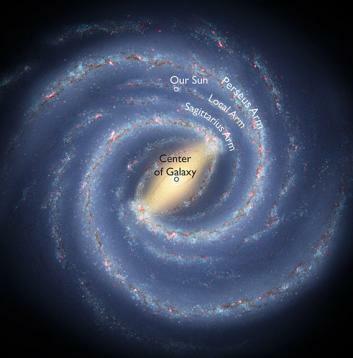 Our galaxy is a flat disk, and we are inside that disk, about halfway from the center to the edge. When we look toward the galactic center, it’s like being in the suburbs and looking toward the downtown region; there are more lights in that direction, and it’s brighter there. Since the galaxy is flat, we see it as a thick stream of light across the sky, like milk spilled by the gods across the heavens. That’s why it’s called the Milky Way; we mean both the way it appears in the sky as well as the galaxy itself (you can usually tell which one astronomers mean by the context). The word “galaxy” is derived from the Latin for milk! The thickening at the middle is called the hub or bulge, and we see it in other disk galaxies, which is another strong bit of evidence we live in such a galaxy. We also know about our galaxy’s spiral arms by looking out into it using radio telescopes and measuring the velocities and positions of giant clouds of gas; they trace the structure of the Milky Way’s magnificent spiral. Pictures like Shainblum’s are certainly beautiful, but they also hint at the depth and nature of the Universe. It’s like a code, or a puzzle, with the pieces gathered and just waiting to be assembled. That’s one of the many reasons I love science! It helps us see the bigger picture.